Do not fold, spindle or mutilate. Those instructions were once printed on punch cards that fed data to mainframe computers. Today’s smart phones process more data, but they still weren’t built for being shoved into back pockets. In the top panel, this three-atom thick crystal is shown as semiconductor that is non-conductive. An outward tug on the material (shown in the middle panel) clicks the crystal into a metallic, or conductive state. The third panel shows the crystal back in a non-conductive state. In the quest to build gadgets that can survive such abuse, engineers have been testing electronic systems based on new materials that are both flexible and switchable – that is, capable of toggling between two electrical states: on-off, one-zero, the binary commands that can program all things digital. Now three Stanford researchers believe that they’ve discovered just such a flexible, switchable material. It is a crystal that can form a paper-like sheet just three atoms thick. Computer simulations show that this crystalline lattice has the remarkable ability to behave like a switch: it can be mechanically pulled and pushed, back and forth, between two different atomic structures – one that conducts electricity well, the other that does not. “Think of it like flicking a light switch on and off,” says Karel-Alexander Duerloo, a Stanford Engineering graduate student and first author of an article in Nature Communications. So far this discovery only exists as a simulation. But co-author and team leader Evan Reed, Assistant Professor of Materials Science and Engineering, hopes this work will inspire experimental scientists to fabricate this super-thin crystal and use it to create electronic and other devices that would be as light and flexible as fibers. Theoretically, such electronic materials have potential to reduce battery-draining power consumption in existing devices such as smart phones. This new, power-efficient material could also make it possible to create “smart” clothing – imagine an ultralight cell phone or a GPS system integrated into your shirt. 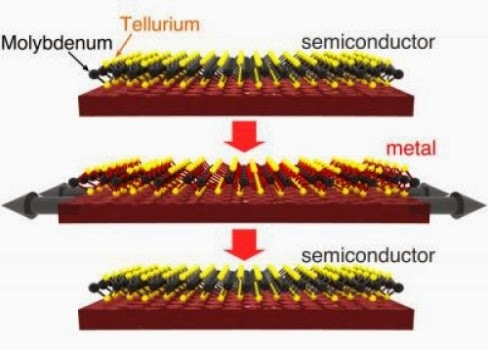 Duerloo said this switchable material is formed when one atomic layer of molybdenum atoms gets sandwiched between two atomic layers of tellurium atoms. Molybdenum and tellurium are elements that are currently used as additives for making alloys, such as steel. Tellurium is also an important component of many modern solar cells. In his simulation, Duerloo relied on the fact that molybdenum and tellurium form a sheet-like crystal lattice that is just three atoms thick. Notably, this atomic sandwich can form different crystalline structures that have useful properties: in one structure this lattice easily conducts electricity; in the other configuration it does not. Duerloo’s simulations show that it takes just a tiny effort to toggle the atomic structure of this three-layer amalgam from a non-conductive state into a conductive state. A gentle push switches the material back to the off state. hese simulations, as yet unsupported by experimental confirmation, are at the leading edge of a new branch of materials science that delves into the behavior of monolayer substances. The first and most famous monolayer is graphene, which was first observed in 2004. Graphene is a layer of carbon atoms that form a lattice that resembles chicken wire. Although it is just one atom thick, graphene is incredibly strong. A sheet of graphene could bear the weight of a cat without breaking this atomically thin lattice. Graphene is also electrically conductive. That makes it potentially useful as a light, low-power electronic component. The discoverers of graphene shared a Nobel Prize in 2010. But even before this their work was so honored that other scientists had started looking for other monolayer materials with this interesting confluence of properties: strong, stable, crystalline structures that could conduct electricity. To help find the most promising materials from a vast universe of molecular structures, a new discipline is rising: computational materials science. “We’re like the advance scouts that survey the terrain and look for the best materials,” Reed said. Now that they have simulated the potential of this molybdenum-tellurium crystal the Stanford researchers – the third team member is graduate student Yao Li – hope experimental scientists will explore possible uses of this three-atom thick switch. “No one would have known this was possible before because they didn’t know where to look,” Duerloo said. 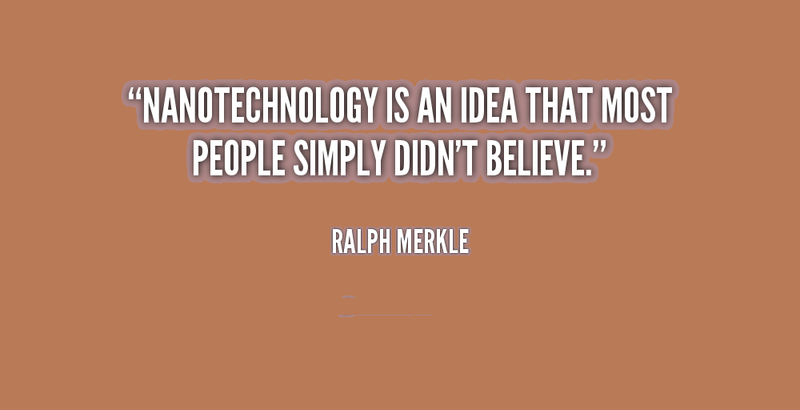 SOURCE :Stanford Engineering tabate@stanford.edu or 1-650-736-2245.
nanotechportal. Watermark theme. Powered by Blogger.